Church parades are once a month (of which 6 must be attended a year) and are held at local churches . 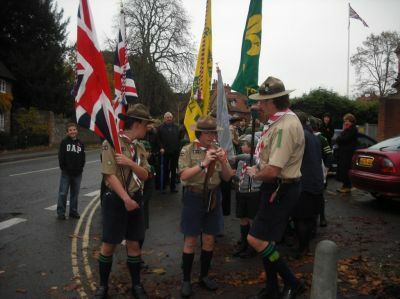 Before and after attending a (usually family) service Beaver, Wolf Cubs, Scouts, Senior Scouts and Scouters parade with the colours and union flag. Services that are particularly important are the St. Georges Day Service (organised mainly by the scout group) and Remembrance Sunday.